Mac OS X may be the greatest operating system in the world, but somehow that news hasn’t reached most of the planet. The sad fact is that most of us are surrounded by Windows PCs. 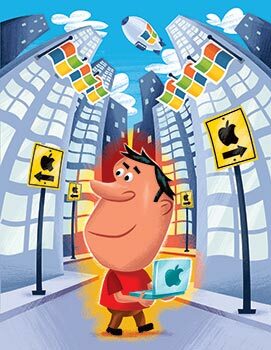 And while it’s easier than ever to share files and networks with Windows systems, Mac users still often feel like strangers in a strange land. That’s why we’ve collected a few of our favorite tips for getting along with the Other Side—techniques, hacks, and utilities to help you fit in so seamlessly that your Windows-using colleagues won’t even know, much less care, that you’re using a Mac.